We have packed up our little studio and have bid farewell. We have been so happy there but things move on and new pastures beckon. I took some photos on my final visit to share with you. 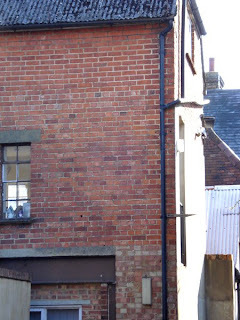 Everyday after parking the car i would glance up at our little window to see if Alice was in before me. If she was i knew that the kettle would be on ready for the first cup of the morning. 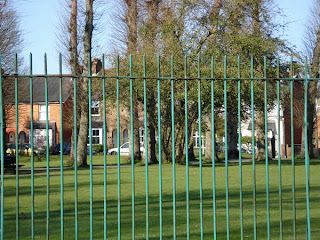 There are two ways to walk to the front of The Old Bakery; one through the Market square or the other, as i often preferred, to walk around the back, past the railings at the top end of the Public Gardens. Much of my youth was spent here hanging out with my friends. My grandparents lived in one of the terraced cottages behind the park, this place seems timeless to me and holds many special memories. As i turn the corner and look across to Lenten Street this wonderful house welcomes me. This photo doesn't do it justice as twice a year it's frontage is covered with Wisteria flowers. It is heavenly. I always meant to photograph it. I will come back again when it is in flower, so i can show you. The main building is 18th century but it has a 19th century addition on the right. It was rented in 1809-11 by Henry Digweed and family and was visited by Jane Austen. Lenten Street is home to some beautiful historic houses. Rose cottage was once owned by Jane Austen's brother Frank and number 25 Lenten Street was the birthplace of the botanist William Curtis. 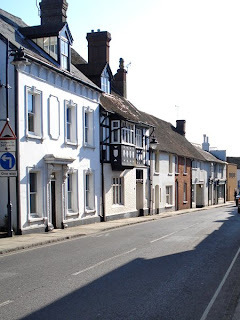 For further information and history about Alton please follow link. 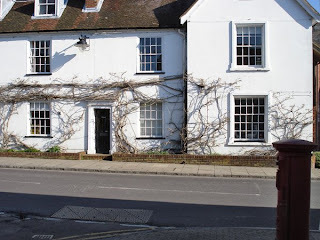 For details of Jane Austen's house in Chawton (a stone's throw from where i grew up) and forthcoming events, click here. 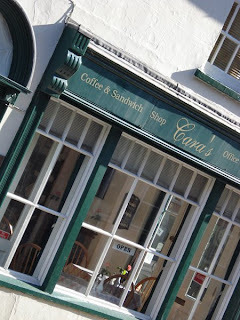 The Old Bakery is opposite Cara's cafe/tea shop where we often bought a slice of lemon cake, and a brownie or two. We shall miss it. 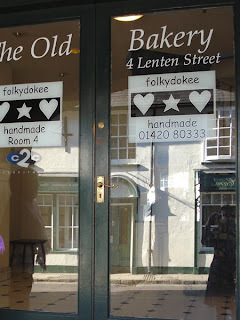 The Old Bakery entrance greets you with two massive folkydokee sign which Alice's Dad organised for us. They are so big that they are kinda shouty. They always make us smile. Must remember to take them down now. 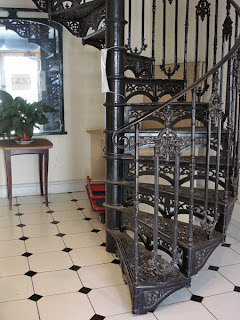 In the lobby you can see the spiral staircase. I was so trashed after moving about 20 crates of fabrics and haby, various shelving and storage chests down these stairs but at least it is the last time i will do it . 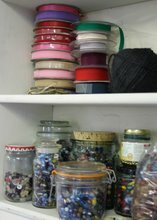 Gigibird asked what we were going to do with all our accumulated fabric stash. 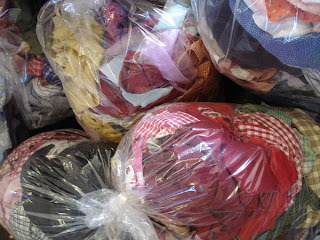 Well we have kept all of our most precious fabrics and small pieces of most of the others. 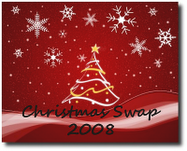 We have donated many bits to all our local schools and sold off some lengths. 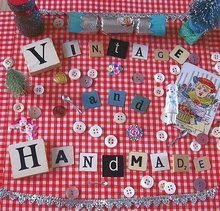 I have saved some good pieces which i hope to ebay and the rest has gone into scrap bags also for school use. We often bought or were given old clothing from charity shops. 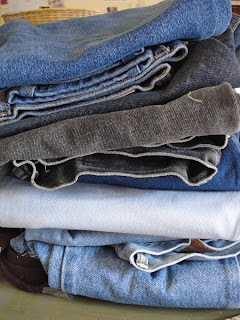 Many of these were still complete , like these jeans, so a good few bags were returned to the local charity shops for resale. So what happens next? Well everything is stored at present until our home spaces are ready, so back to the kitchen tables for us, where we started. Gosh this is a long post... if you have got to this bit well done! thank you all for your sweet comments on the last post... i will continue the Flour Loft for the moment and trace these next months here in this blog space......and then after that who knows.....not even me! Happy Monday wherever and whatever!!!! Hi there, sorry to see you shut up shop. 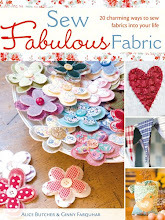 I've only just found your blog and loved looking at your pictures. I'm an ex-Farnham girl so know the area well. Good luck with the book and your future ventures! Good luck with all that's new and just around the corner, another exciting adventure to be had! Hi Ginny -goodness working above whatlooks like a yummy bakery would be my downfall. It's nice you have taken photos so you can remember all the happy times you have both had. 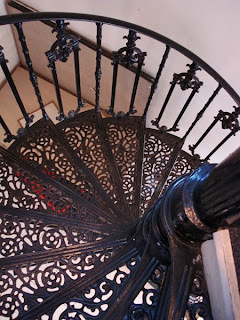 Such inspiring surroundings - I am sure you won't miss the lugging of stock up and down the stairs! There is a kind of sadness about this post, I suppose it's always a bit sad when you leave one thing to start another. Ginny.. so sorry I have missed all of your recent events.. School holidays are so busy!! I wish you much success in your new quarters and happy times too..
P.s Just love my corsages and where them all the time! OOps.. sorry.. should have said 'wear' them all the time.. silly me!